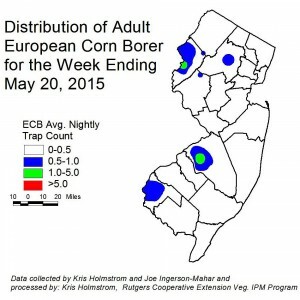 European corn borer (ECB) adults are being captured with increasing frequency now. At the present, areas of highest activity include Burlington and Warren counties (see ECB map). Cooler nights for later this week may suppress catches for the next several days. Two corn earworm moths (CEW) were captured in blacklight traps this past week. These individuals were at Centerton and East Vineland. 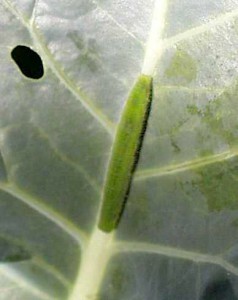 Infestations of imported cabbage worm (ICW) are occurring at this time. Scout plantings weekly. Check 5 consecutive plants each in 10 random locations throughout the planting, paying particular attention to the innermost leaves where ICW often feed. Consider treating if caterpillars are found on 10% or more plants that are in the 0-9 true leaf stage. From 9-leaf to the early head stage (in broccoli, cauliflower and cabbage) infestations up to 20% may be tolerated. Once heads begin to form, a 5% threshold should be observed to protect the marketable portion of the plant. For leafy greens such as collards and kale, 10% plants infested is the threshold throughout. Many early tomato plantings are now in the field. Pruning and tying of plants is on-going. Remember that any event that results in contact with the plant causes numerous injuries to them. While these injuries heal, they serve as avenues of entry for bacterial pathogens that may be present either on the plants or in the field. Serious bacterial pathogens of tomato include bacterial leaf spot and bacterial canker. Both can result in unmarketable fruit, and canker can kill plants prior to the production of fruit if the infection occurs early enough. Timing and rates for applications of copper and/or the plant defense activator Actigard are detailed in the 2015 Commercial Vegetable Production Recommendations. These products provide some suppression of bacterial pathogens. It is critical, however, that spread of bacterial organisms be limited as much as possible. Avoid working in fields when plants are wet. When work is to be done in more than one planting, always work from youngest to oldest plants. This prevents workers from transporting bacteria to younger plants, where infections can result in increased crop loss. Remember that the earlier a plant is infected by a bacterial pathogen, the more likely it is to produce unmarketable fruit. Two-spotted spider mite (TSSM) infestations have recently been discovered in a high tunnel in Middlesex County. TSSM feeding results in small white pin-spots on the upper leaf surface. Mites are actually underneath leaves. 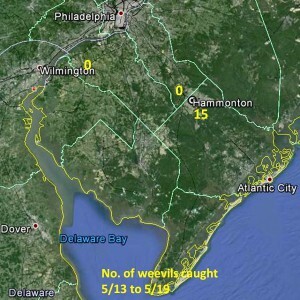 These pests can increase dramatically in the warm, dry environment of the tunnel. Check 5 plants each in 5 separate locations in the tunnel. Inspect the entire plant, and be sure to check the underside of leaves that display the whitish mite feeding. If mites are found, it is best to immediately treat. TSSM is much more easily managed, when the problem is addressed at low levels. If allowed to spread throughout the tunnel, TSSM will be much more difficult to control. See the 2015 Commercial Vegetable Production Recommendations for materials that are labeled for use in greenhouse structures. It may be possible to deploy predatory mites such as Neoseiuilus falacis or Neoseiulus californicus in the tunnel to limit TSSM populations. This and other TSSM predators may be purchased from bio-control suppliers such as Koppert. The main drawback of this strategy is that predatory mites generally have much lower tolerance for heat than TSSM. Therefore, if outside weather is routinely exceeding 80°F, and the tunnel temperature is exceeding 85°F during the day, it is unlikely that predatory mites will survive long enough to have a significant impact on TSSM. Aphid populations have also begun to appear in high tunnel tomatoes. These pests often form colonies beneath the surface of leaves and near growing points on the plant. While the plants consist primarily of vegetative growth without fruit, aphids are largely an insignificant pest. If no broad spectrum insecticides are used on the plants, the aphids generally are decimated by predators and parasites before becoming an economic problem. Should aphid populations increase to a degree that their droppings are accumulating on the surface of developing fruit, an insecticide that specifically targets these pests may be necessary. See the 2015 Commercial Vegetable Production Recommendations for materials that are labeled for aphid control in tomatoes. Avoid broad spectrum insecticide classes such as synthetic pyrethroids as much as possible. To date, only a few scattered BMSB individuals have been captured in the blacklight network. As levels in any area rise to an average of above 1/night, a population map of this insect’s activity will appear in this publication. 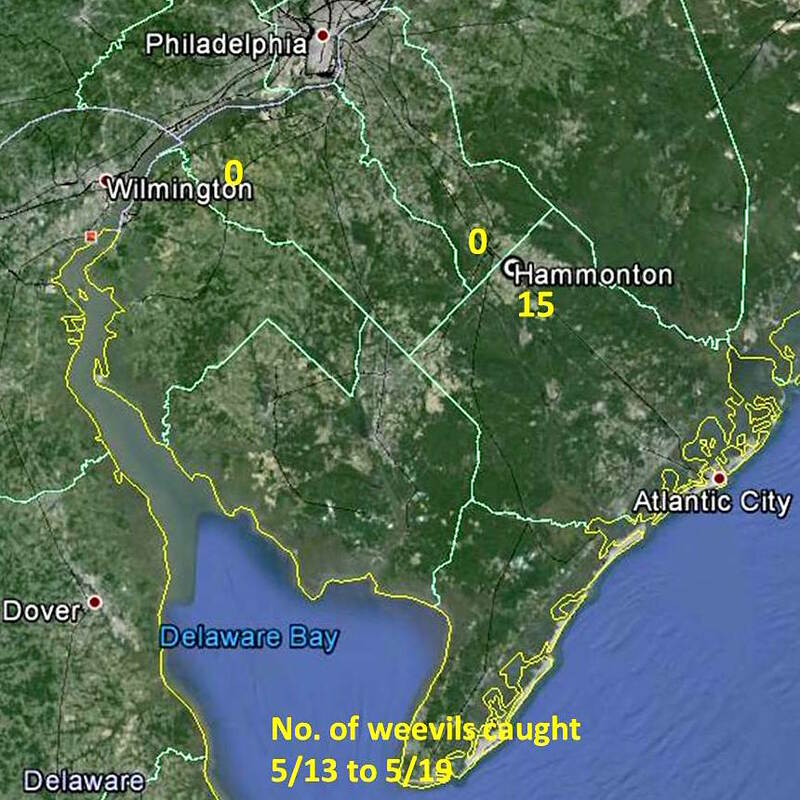 Joe Ingerson-Mahar reports that, although pepper weevil catches in the southern NJ weevil trap network are generally lower than in previous seasons, there was a recent spike in activity in the Hammonton area (see pepper weevil map). Reports on this insect’s activity will appear in the Plant and Pest Advisory on a weekly basis, with relevant control information.